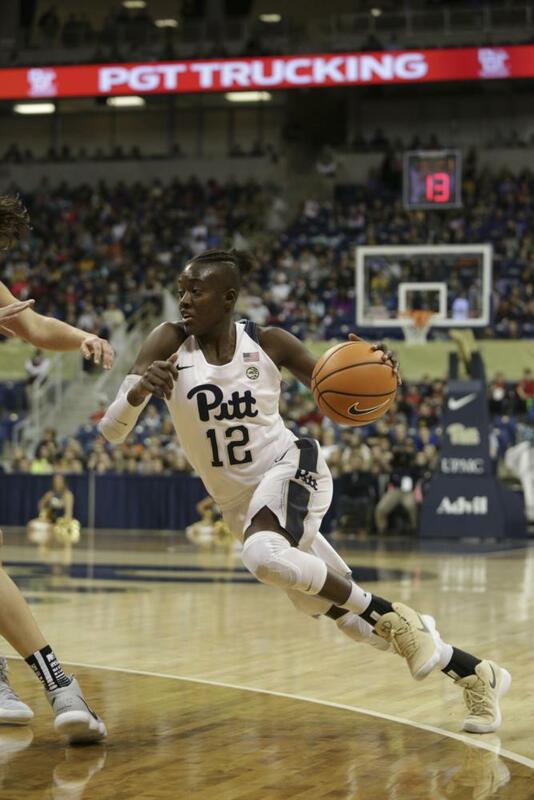 The Duquesne women’s basketball team claimed their fourth straight City Game Thursday night when they defeated Pitt, 66-53, in a back and forth battle. The Panthers (2-1) hosted the night’s Pittsburgh rivalry match against the Dukes (2-1), but there were unable able to claim their third win of the season or end the Dukes’ series streak. Diop, a redshirt junior forward, and Walters, a junior center, scored a combined total of 43 points, with Diop posting 22 and Walters scoring 21. The tandem also combined for 10 rebounds. But it wasn’t enough to make up for Pitt’s poor shooting and defensive plunders. The matchup opened with an exchange of turnovers between the Dukes and Panthers before Duquesne junior guard Chassidy Omogrosso scored first with a layup. The Panthers replied quickly as junior forward Danielle Garven pulled up behind the arc and nailed a three. The two sides continued to exchange blows throughout the first quarter, but when Garven struck again from behind the arc the Panthers moved back into the lead at 8-6. The momentum remained neutral as play carried on, but when Duquesne junior guard Julijana Vojinovic sunk two threes, the Dukes took over. After claiming their 17-12 advantage, the Dukes held onto a lead for the remainder of the game. After a highly contested first quarter — which saw a total of eight lead changes — Duquesne redshirt sophomore combo guard Paige Cannon opened the second quarter by extending the Dukes’ lead. Walters cut the Panthers’ deficit to single digits, though, after making a layup of her own. Walters also denied the Dukes’ attempt to stretch the lead again as she blocked Omogrosso’s shot. The blocked shot fell right into the hands of Vojinovic, however, who sunk yet another triple giving the Dukes’ the lead 27-16. Vojinovic finished the game with 23 points, with 15 coming from 3-point range. The Panthers and Dukes continued going back and forth with shots, but when the quarter ended the Dukes were up at the half 34-26. The Panthers’ first half was defined by sloppy play and poor shooting. They committed nine turnovers which led to 12 Duquesne points. Pitt’s field goal percentage, however, was just below Duquesne’s, at 35.7 percent and 40 percent, respectively. Diop nailed a triple and cut the Panther deficit to five points as the second half opened. The Dukes answered with two layups on their next two possessions to extend their lead to 38-29. After Diop traveled to the foul line and made one shot, the Dukes went on an 8-0 run. Walters ended their run when she drove to the basket for a layup, making the score 46-32. The Dukes and Panthers exchanged layups, and as the third quarter came to a close the Dukes added a free throw from junior combo guard Kadri-Ann Lass and a jump shot from redshirt sophomore forward Eniko Kuttor for a 51-36 lead. As the fourth quarter picked up, the two teams exchanged turnovers until Diop drove to the basket and converted a layup. After a set of free throws for Pitt, the team executed an inbound play that led to another lay in for Walters. Even with Walters’ performance, physical play from the Panthers sent the Dukes to the free throw line and gave them a 10-point lead. The game wound down slowly as Pitt attempted a series of intentional fouls to try and mount a comeback. Their attempts were unsuccessful, though, and the buzzer ended with Duquesne claiming victory, 66-53. The Panthers look to maintain their winning record as they take on Towson Sunday at home with tipoff set for 2 p.m.